Growing up in the Peak District, I was largely unaware of the “big three” bus companies in the UK until I developed more of an interest in the industry. With the exception of one route, Ashbourne was served by a group of independent operators, Trent buses running the main route to Derby with small firms such as Glovers and G&J Holmes operating the others. Slightly larger firms, from a bit further away also ran some services, such as D&G, TM Travel and Bowers. 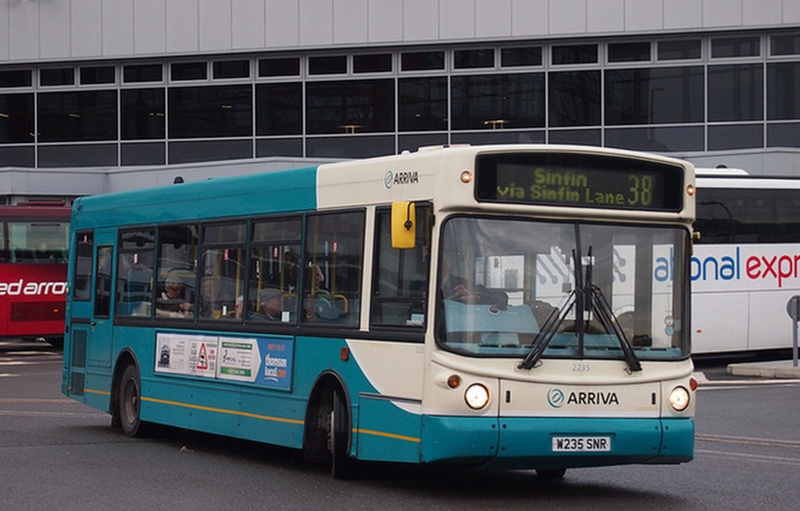 Arriva ran the 109 to Derby via the long route, but they seemed no different given their tiny presence in the town. 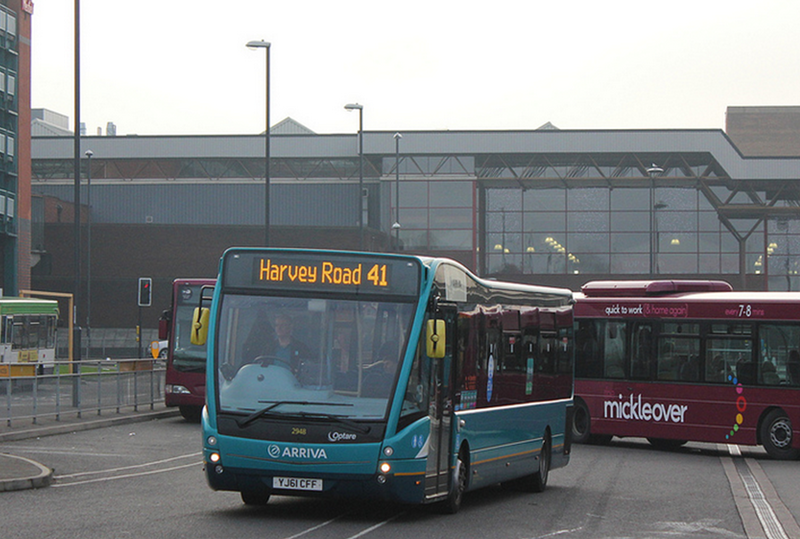 Ashbourne is now one of the few towns where the "big 3" operate no services at all. 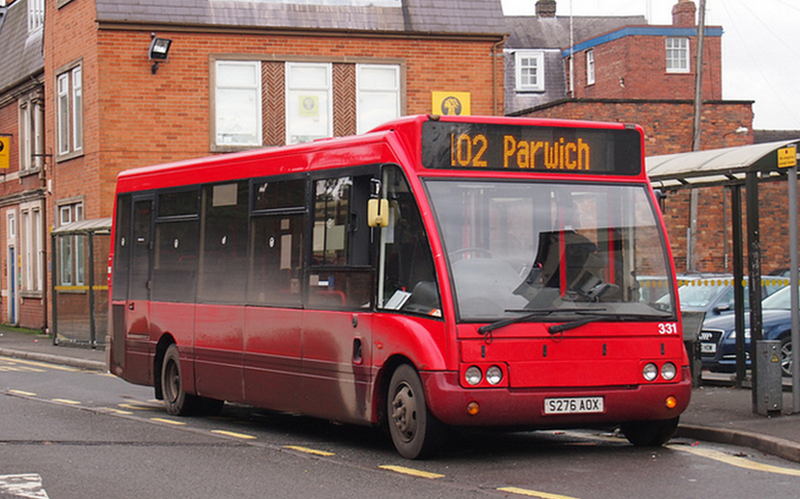 Services are mostly ran by High Peak, Trent Barton and Yourbus. Derby was slightly different, Trent buses, then Trent Barton were the company providing the long distance services and some suburban ones, whilst the majority of inner city services were ran by the aquamarine buses of Arriva Derby in their generic colour scheme which could be seen all over the country. In contrast to the obviously local Trent Barton, they felt distant and impersonal. Too large a firm to care or be that bothered about issues in such a tiny part of their empire. This showed in the poor state of their fleet, very little was DDA compliant (whilst Trent Barton had managed an entirely low floor fleet) and the buses were old and tatty. In 2008, it seems that someone in Sunderland remembered about Derby, and a lot of money was invested into new vehicles for the city. The network was re-examined and from my experience patronage has increased as a result. It took a long hard look at a specific area to realise and resolve the problems. This, to me seems testament to the fact that a local focus is vital to running a successful bus company, as opposed to a national strategy. ...however there has since been significant investment. And it seems that bus companies are waking up to this fact. Whilst York does see a lot of independent operators, the services are dominated by First, and to a lesser extent Transdev. Both are multinational companies with operations all over Europe and in First’s case the world. 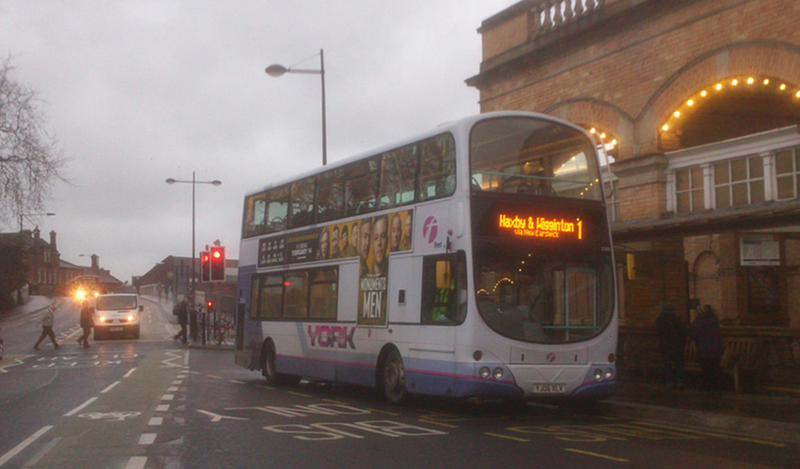 But both operator’s standard liveried vehicles have “York” stuck on the side of the buses in huge letters. It lets passengers know that they matter to the company, and that, in this case York, is thought about on its own. It is its own place with its own issues which need to be looked at individually. This is something that Transdev (and their predecessor Blazefield) have always been good at. Giles Fearnley and Stuart Wilde had a vast network across the North of England, from Whitby to Blackburn, but rather than rolling out one uniform brand, each area was ran individually with its own local name. As such, today we see names such as “Harrogate and District” and “Lancashire United.” It is seemingly an approach that Fernley has taken over to his new employment within First group. The first buses in the new First livery had the names of their operating area placed on the side and this has continued ever since. The buses operating in York in the new livery have (funnily enough) York written on the side, in purple writing with the silhouettes of landmarks on the side, such as the Minster and Millennium bridge. It is a trend repeated across the country and gives First a more personal feel. 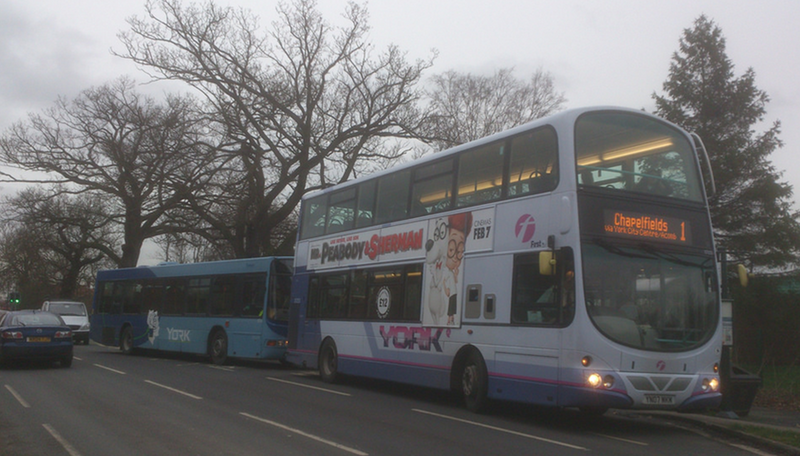 More and more buses in the First York fleet are having the new fleetnames applied. But in the South of England, one arm of the First group is taking things a little further. 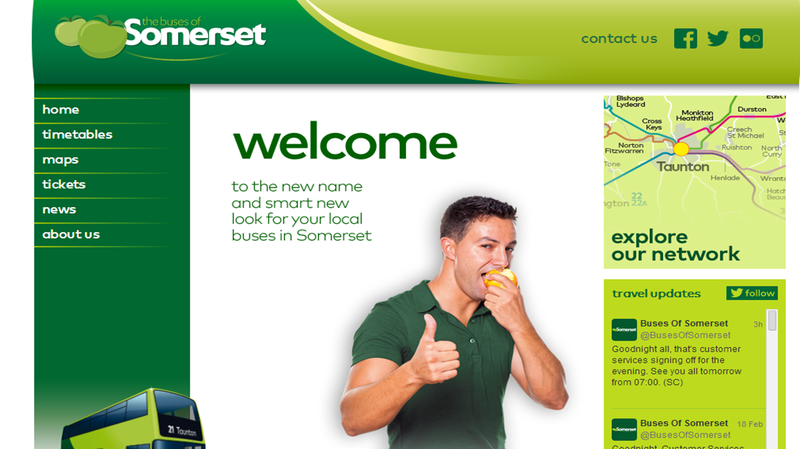 Those taking a look at “The buses of Somerset” would probably have no idea that it was a First subsidy. The Stenning designed website seems more akin to Go-Ahead but it shows a whole new approach for Frist group. The website explains “Over the coming months we’ll be giving your local First buses a bit of a makeover, with smart new colours, a stylish new look and a name that means something locally.” A lot of investment is no doubt going into this new brand, which seems to show that a locally recognisable identity is becoming more and more essential in encouraging passengers onboard. A whole new approach in Somerset from First group. So will we see such a scheme in York? Unlikely at this stage I would presume (the Northern England First divisions don’t seem as adventurous as their Southern counterparts). However, locally recognisable and therefore accountable bus divisions do seem to be the way forward. Within the next six months or so, I will imagine all of First York’s buses will be in the new livery, complete with ‘York’ logo. Passengers will know that this is one of York’s buses and will only be used in York and is, in essence ‘theirs.’ I doubt this will have a dramatic effect on ridership, but it clearly comes with its benefits, as First’s investment in Somerset seems to suggest. All York photos courtesy of Chris and all Derby photos courtesy of Matt.